Northeastern University has been at work for nearly three years, with plans and construction already under way, to put major new buildings in their campus that is surrounded by Mary Cummings Park. 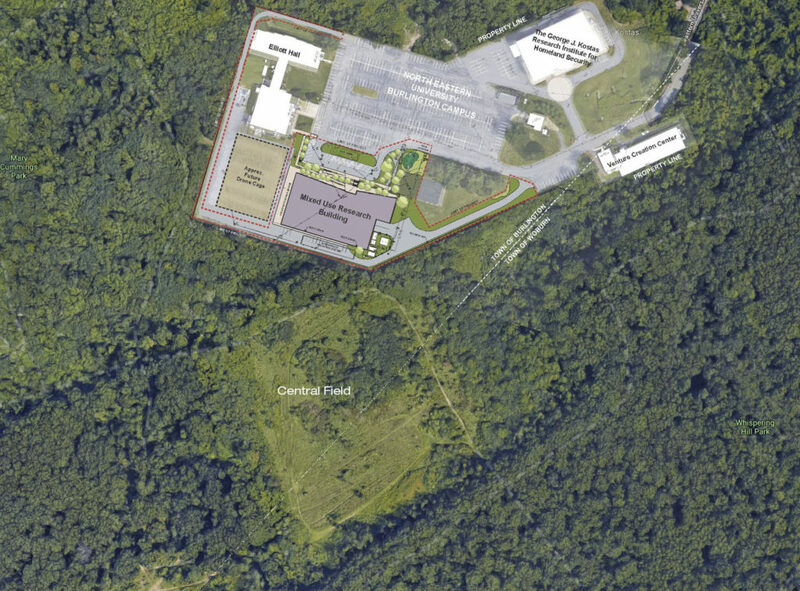 We have only recently become aware of the scope of these developments, which are being pushed into construction at an accelerated pace that surprised members of Burlington’s Planning Board. There will be another hearing on Thursday, March 1, in Burlington’s Town Hall, in the 2nd floor main hearing room. The public is allowed to attend these meetings and make comments or ask questions. If you have concerns or questions about these new structures and site changes and would like to express your concerns or ask questions, please attend the March 1, 2018 Planning Board meeting. A 60 foot tall outdoor drone cage. What will be the visual, light, and noise effects upon the park? A 70 foot tall research building placed at the current park entrance, with HVAC on the roof. A loading dock placed right at the current park entrance. Will there be a new public entrance? The public has been able to visit the park via the campus for decades. Will the public still have access? What will happen in terms of fencing around the park? This is a link to the PDF that Northeastern has made available with more information about the new development. This shows the new drone cage and research building, which are going up right on the property line of the park. 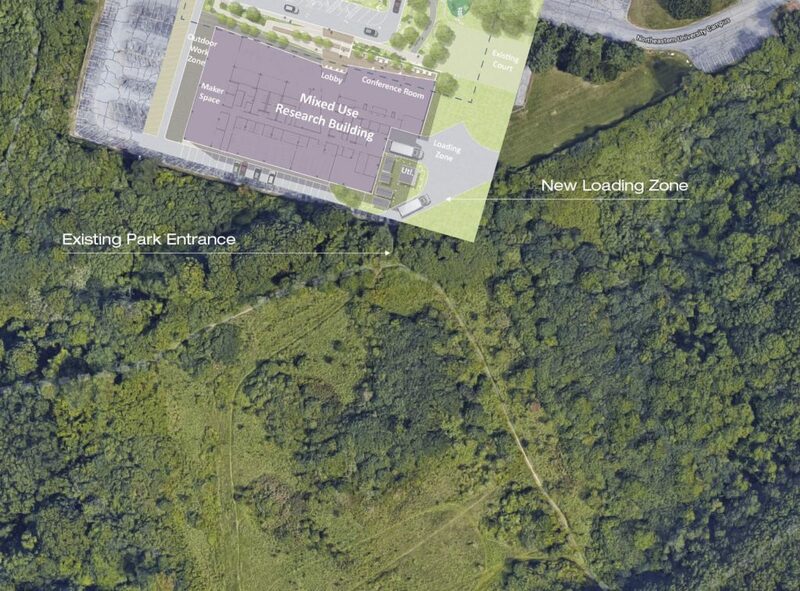 This shows how the loading zone of the new building is placed right at the existing park entrance. 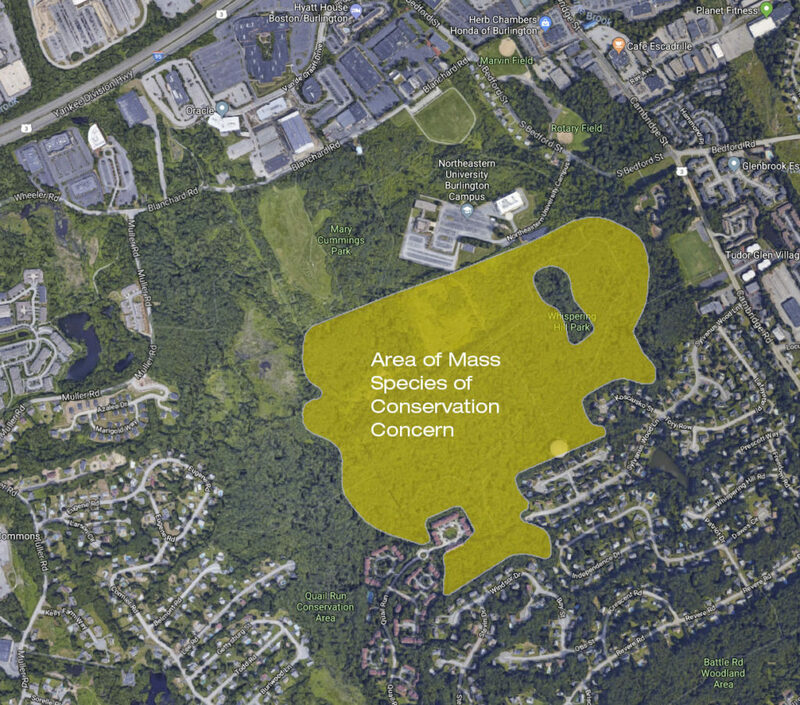 This shows the closeness of the new structures to the existing Mass registered priority habitat.